Thanks to Silvermoss http://silvermoss.blogspot.com/ for putting me up for a ‘Lovely Blog award’ I shall put more details when I stop chasing my tail! In the meantime it seems that I haven’t stopped and haven’t got anything done! Just before heading off to Cornwall (thanks for all the kind messages and wishes) it went well, and due to the poor weather we chose a lovely spot on a secluded beach that I know Chris loved and visited often. Before heading off I managed to repair my ailing PC! Hurrah! I’d previously tried fitting a PSU a friend had lent me, which also turned out to either be faulty as well or incompatible! Still, it gave us an excuse to catch up and have a couple of beers. 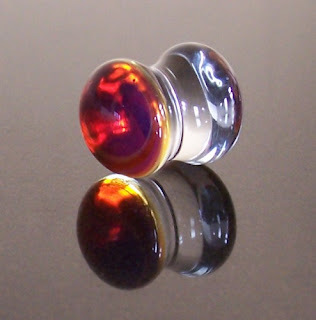 I have been working on a very exciting range of new marbles, more of which I shall bore you all at a later date! In the meantime I have also listed a few of the earplugs on Folksy and Coriandr shops to see if they generate any interest, although I doubt I will carry on with these as I want to concentrate more on marbles at the moment.